Princess Polish: Announcing: Zoya Go Braugh giveaway! Announcing: Zoya Go Braugh giveaway! Inspired by a Zoya promo last year in which Ivanka, Suvi, and Shawn were featured, what better way to celebrate St. Patrick's Day than with a trio of Zoya greens! And the best part is that YOU get to choose your prize! I love Suvi!! Also, just wanted to let you know that your auto tweet text was too long so I had to modify it slightly. Hope you'll still accept it as an entry. Thanks! I love Ivanka! <3 Thanks for the giveaway! I can't just pick one! Ivanka, Rina, Holly.. I like Ivanka out of the 3 Zoya greens posted. Such a pretty deep, frosty green! I love Ivanka too. Beautiful green! Mmm, Ivanka has always drawn me, although Vertuschka is nice also. Shawn is my favorite Zoya green, but I LOVE green! i honestly cant choose!! ivanka & shawn definately!! Shawn is my favorite green! So far Irene is my favorite, but I need Midori too! Ivanka is my favorite of the trio! Although I do not have any of those colors, I have to say Shawn! You can never have enough glitter, so I choose Ivanka! With a nice glossy top coat, this would look ah-mazing. Formerly Shawn, she has now been toppled by the outstanding Evvie. My fave Zoya greens are Bevin and Apple. Awesome giveaway! If I win and choose my 3, I'd choose Apple, Midori and Suvi! Hard to choose, but I think Ivanka! My fave Zoya is Jana but I love all of their colors! ivanka is definitely my favorite. but ive been meaning to pick up shawn so im hoping i win!! Green. . . .it's my FAVORITE color, so I love them ALL! :) Thanks for offering this giveaway! A toss up right now between Bevin and Apple. The first bottle - Ivanka - what a gorgeous green nail polish! Ivanka is my favorite Zoya green. Midori, but out of these I'm liking Ivanka the best! Love Shawn. Thanks for the Irish Cheer! I love love love Zoya Apple!! I *love* that Shawn!! Green isn't normally my color but I can't stop staring at it! My favorite green from Zoya is Yara. I don't own any Zoya greens yet, but have my eye on Ivanka. 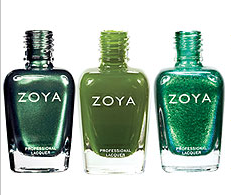 Zoya Bevin is my favorite green!! O.M.G. Green is my favorite color!! I neeeed these!!! Those are gorgeous greens, but my favorite would be Ivanka or Holly! Thanks for the giveaway. I like them all but Shawn stands out to me! The only Zoya green I have so far is Irene; I think it looks good on me so I guess you could call it my favorite! Edyta is the richest, most complex green-gold-black? that I've ever seen! Love it so much! I love Ivanka! My total fave! I do love Ivanka, but my favorite is Yara. Soooo pretty!!! Tie between Ivanka & Shawn... but Shawn is a tad ahead of Ivanka! Edyta. Always requires a double-take! i love your nails! your blog is great! yara is my favorite! i'm wearing it now! gonna have to go with Shawn! Hmmm...I'm thinking "Shawn" is my favorite, too! I ♥ Shawn the best..
My favorite is Dree! I love so many of their greens though! Gotta be Ivanka for me too! I think it will have to be Edyta. I don't have any Zoya greens yet, so I don't know which is my favorite. But I tend to like minty and candy greens. My favorite Zoya green in my collection is Envy, otherwise I love Shawn and Yara! I love Apple. It isn't one of the 3 in the givaway but, it is such a pretty green with gold shimmer! SUVI ALL THE WAY! Jk I love green so I can't really decide but of the three in the picture, Suvi is my favorite. I love the way Ivanka sparkles! Gemma is my favorite that I own. Out of these three, Ivanka! I love Gemma, but of these three, I am lovin' Shawn! Since Zoya is my favorite nail polish and green is my favorite color, it's really hard for me to choose! I think I'll go with Holly, since I love shimmers. I'm wearing Ivanka right now and am loving it! Yara for now, but I really want Irene!